Store and organize your cherished dinnerware with the Sorbus 5-Piece Storage Set. Providing service for 12, this quilted set is designed to hold dinner plates, salad plates, dessert plates, saucer plates, and cups. A top loading design allows for easy access and the gentle nylon zippers keep your cases sealed and protected from dust. It features padded felt protectors to cushion plates and cardboard dividers to protect glassware and mugs from damage. With proper placement, cases can be stored in hutches, cabinets, pantry closets, or the buffet. For added convenience, add a chic label using the content label insert to quickly identify dishes for your next dinner party or afternoon tea. Keep your dishes in mint condition and ready to shine for special occasions. No more time-consuming searches for your prized tableware! This set is allows you to arrange your place settings with ease whether the meal is casual or formal. When the meal is over and you're ready to hang up your hostess apron, return your dishes to its safe home in storage. 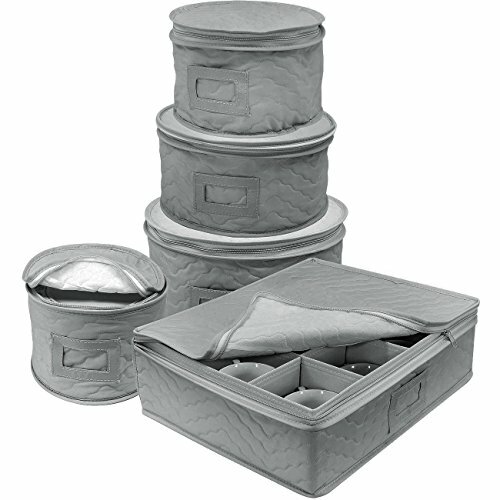 For china sets that only come out during special occasions or holidays, such as Thanksgiving or Christmas, consider storing all your pieces with durable quilted protection instead of old boxes and newspaper. It's ideal for precious china, expensive dinnerware, or priceless inherited heirlooms from generations before. Dishes can be switched out as seasons or decorating tastes change throughout the year. This special piece is destined to make a great housewarming, hostess, or bridal gift!